McLaren and Red Bull team bosses Martin Whitmarsh and Christian Horner have engaged in a public row over the latest rule changes. F1 bosses have restricted the use of exhausts to generate downforce, but the rules have changed after pressure from Red Bull's engine supplier Renault. Whitmarsh fears Red Bull now have an advantage and complained the situation was "cloudy, ambiguous and changing". Horner said governing body the FIA had been "right, fair and equitable". In the same news conference, Team Lotus boss Tony Fernandes described the situation as "a little bit of a shambles". Horner and Whitmarsh argued over which team had been given the biggest advantage following the latest in a series of rulings aimed at limiting a practice called off-throttle blowing of the diffuser, which has become a key issue in F1 in the last year. This is where teams blow exhaust gases over the rear floor of the car even when the driver is not pressing the accelerator, smoothing the airflow and therefore increasing downforce and grip. Horner said Renault had objected to an earlier ruling because it had given the Mercedes-powered teams, including McLaren, an advantage over Red Bull. 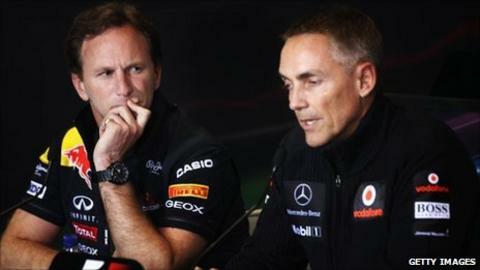 Whitmarsh believes Red Bull now have an advantage after the latest change. The issue has been complicated by the fact that all engines work differently, so it is impossible to impose a uniform ruling. Renault and Red Bull had objected to a decision by the FIA to allow Mercedes to introduce fuel on the over-run - when the engine is being used for braking. Although the engine is reduced to running on only four of its eight cylinders at this point, this will inevitably lead to some blowing of the diffuser, and therefore the creation of some downforce. Renault, by contrast, does not fuel its engine on the over-run and argued that it should be allowed to compensate by opening the throttles to a specific amount, something it says it has always done to ensure reliability. The FIA has accepted Renault's argument and the French company will now be allowed to run its engines on 50% throttle when the driver is not pressing the accelerator. This has angered their rival teams, as the initial intention of the ruling was to limit throttle opening to 10% when the driver lifts off. The public argument between Horner and Whitmarsh was prompted when BBC Sport asked in an official news conference how, under these circumstances, it could be guaranteed that all teams were competing on an equal footing. Horner said: "As far as we understood, before Renault were allowed their parameters, there was a significant advantage going to any Mercedes-powered team." Whitmarsh said the ruling meant a "very substantial performance benefit" for Renault. Horner disputed that, saying: "Let's not make any mistake here. Firing on over-run, the thrust that that generates through the exhaust, generates a bigger effect. Let's just be absolutely clear on that." Whitmarsh said he expected Renault's rivals to go back to the FIA to demand that they, too, be allowed to introduce air through open throttles on corner entry. Both men agreed that the FIA should have changed the rule at the end of the season to avoid the controversy on what Horner described as a "massively complex subject". A meeting took place on Friday evening betweem Whiting and the engine manufacturers to further discuss the issue.